We’ve all heard of peculiar artists and capricious ones, edgy sculptors and angry painters, those who love to offend and shock, unsettle or antagonize. They are the stuff of movie fantasia and social media hype. But in the real world, populated by real people, there is another kind of artist: a happy person, loving what they do, creating with the idea of making others happy as well. 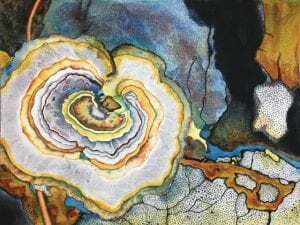 Fitting into this paradigm is Joyce Klassen, a Walla Walla artist who has worked in everything from watercolor realism to her present abstract acrylic pours. She uses words like “fun,” “rewarding,” and “beautiful” when she talks about her art, as well as life itself. “I’ve been interested in art since I was in preschool when I cut up my mother’s Simplicity patterns to make my own paper dolls and dress them in pieces of fabric — I only did that ONCE!” Klassen remembers. The FUN comes from quickly flipping the cup upside down. The CAUTION demands that the artist upright the cup quickly, then tilt the canvas back and forth so the colors run from top to bottom and side to side. The wisdom of EXPERIENCE shouts “Stop!” when the pattern looks just right. 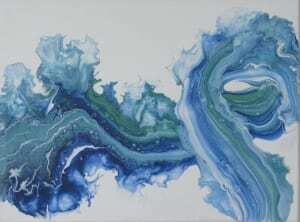 “Knowing when to stop is the secret to a successful acrylic pour,” Klassen explains. “Once you have learned to do this — EXPERIMENT and come up with your own unique method. 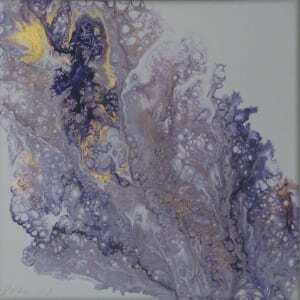 Klassen discovered acrylic pour literally by accident when she spilled mixed paint on a surface. Fascinated by the resulting texture, color formation and shape, she researched the technique, spending “hours and hours” learning from YouTube. “I’ve done many forms of art, but I think I love this one the very best because I get so excited as I watch the colors evolve and mix — it often gives me terrific surprises. She does abstract; he paints realism. She takes up three quarters of their shared studio; he carved out a small space against the window, just enough for his easel and palette. 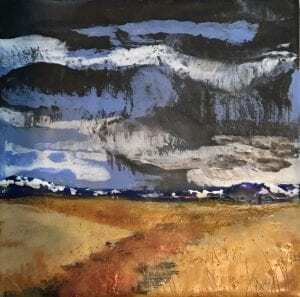 “When I work on encaustic, he leaves when I light the blow torch. “When I work on acrylic pour, he covers his work and leaves to avoid the mess. Oddly, for a person who describes her creative process as messy, Klassen spends a lot of time cleaning their house, because both she and Randy sell from the studio within their home. “We never know when someone might ‘drop in’ to view the art. We love to share a glass of our local wine as we go from room to room looking at art. When she isn’t creating in the studio — something that can happen anytime of the day or even at 2 a.m. if she finds she can’t sleep — Klassen works with the homeless through the Walla Walla Alliance for the Homeless, coordinating the weekly shower project held Mondays at the Pioneer United Methodist Church. She and her crew of 10 volunteers serve the needs of 10 to 17 people who would otherwise have nowhere else to shower, providing basic toiletry needs along with clean socks, underwear, and other clothing. It’s all part of a happy artist’s life — giving, experimenting, dreaming, doing, making a mess and cleaning it up. With so much creativity and beauty, there is no place for angst, anger, shock, or awful. “I love to watch ideas and colors evolve. 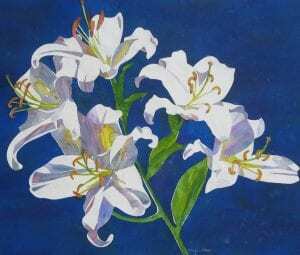 Joyce Klassen is the featured Art Event artists at Wenaha Gallery from Monday, September 24, 2018, through Saturday, October 20, 2018. She will be at the gallery Saturday, October 6, from 10 a.m. to 2 p.m., as part of Wenaha Gallery’s Autumn Art Show, which also features jewelry artist Venita Simpson, a tribute to the late astronaut/artist Alan Bean, and a talk and visit by retired astronaut Dottie Metcalf-Lindenburger. Dragonfly, original watercolor painting by Suzi Vitulli of Richland, WA, celebrating bright colors and happy images. Artists are their own worst critics. Intense, determined, passionate, sometimes frustrated but obstinately tenacious, professional artists know full well what they are doing — most of the time. “One of the favorite awards I ever received is the WSU Chancellor award for a painting that I threw in the garbage,” says watercolor painter and private art teacher Suzi Vitulli of Richland. It was an amazing experience, she adds. And a humbling one. For that matter, the very act of starting with a blank piece of paper and palette full of paint, and winding up with a finished, successful image, is a continuously amazing, humbling experience. “People say that watercolor is the most challenging medium to learn and master, and maybe that’s why I like it,” Vitulli — who doesn’t remember when she first decided to be an artist because she can’t recall not wanting to be one — adds. Due to its transparent nature, watercolor does not take kindly to mistakes, Vitulli explains, because once an area is painted, it’s challenging to lift out the color, especially transforming a darker color into a lighter one. Because the viewer can see through the layers, it is difficult, if not impossible, to cover up errors. But that’s if the artist persists in calling them errors. “So you ask yourself, ‘How can I incorporate this into my painting?’ and it becomes even more of an opportunity to be creative in the process. For Vitulli, flopportunities and opportunities abound, in both her own work and in teaching her skills to others, and the act of painting requires the entire brain, mind, and soul of the artist. To teach, which she does in regional workshops as well as at Richland Parks and Recreation and Kennewick Community Education, she depends upon analytical thinking, math, timing, and planning, while in the studio, alone behind the easel, she dampens relentless logic so that the creative side has its say. Maintaining balance is crucial. “Finding inspiration is the most difficult part,” Vitulli adds. “Sometimes I feel like the paper is staring at me, waiting for me to do something, my mind feeling as blank as the paper. Vitulli is an unabashed fan of color, describing how she entered heaven itself when, as a child, she received the iconic 64-pack of Crayola crayons. Initially in her adult art career, she created handcrafted jewelry, her designs selling at Nordstrom’s and other boutiques throughout five western states. Later, her designs were published in the Hot off the Press book, Fast and Friendly Plastic by Susan Alexandra. 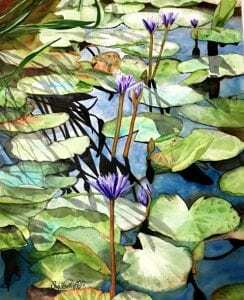 After her kids were in school and she went to work as a secretary (“Not very artsy, I know, but there was a regular paycheck”), Vitulli dabbled in watercolor and quickly discovered that she had found her niche. Weaving between impressionism and expressionism, Vitulli explores texture along with strong color, with the ultimate intent of creating something beautiful and inviting, enticing the viewer to step in and take a closer look. 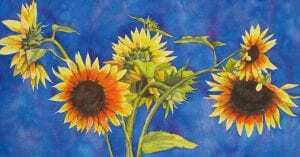 She has sold her work throughout the U.S. and across the Atlantic to the United Kingdom, and her accolades include creating posters for regional art, music, and wildlife festivals as well as a number of wins from the Eastern Washington Watercolor Society. 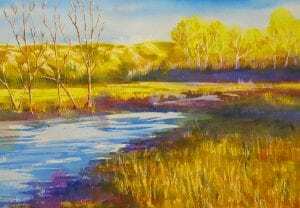 An especial honor was a painting featured in the Splash Watercolor Series books, a juried display of work selected from entries by thousands of artists. “My art is about another very important issue — happy people and a happy society. “My goal is to create beautiful, colorful, interesting and sometimes funny pieces of art, giving people a place to find a few moments to relax into the right side of our brains for awhile. 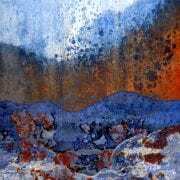 Suzi Vitulli is the featured Art Event artist at Wenaha Gallery from Monday, March 12, 2018, through Saturday, Saturday, April 7, 2018. People who are not early risers get tired of this catching the worm thing, which, frankly, is literally for the birds. As watercolor painter Maja Shaw knows, there’s plenty of time to enjoy a leisurely cup of coffee and still get the perfect photo reference for her next painting. Shaw, whose first name is pronounced Maya, as in the ancient Central American people, focuses on florals with bold, sculptural shapes and exuberant color. Inspired by a childhood spent with art-collector parents, Shaw explores ways of rendering images using negative space, as opposed to intricate detail, to define a form. 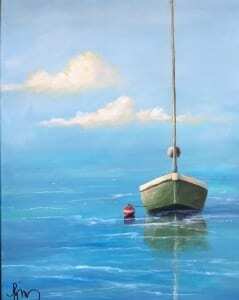 The resultant paintings blend the best of both worlds: representational and abstract. “Highlights and contrast are characteristic of many of my paintings,” Shaw says. 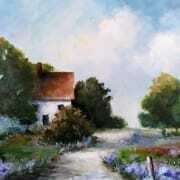 “Two of my favorite painters are Andrew Wyeth and John Singer Sargent. Shaw, who received her Bachelor of Fine Arts from the University of Washington, credits one of her art professors with providing a working definition of the category in which her artwork fits — organizational, as opposed to decorative or expressive. “It’s a style that is concerned with shape, color, and composition and is not so concerned with making a philosophical statement, or, as my professor said, ‘What is the state of man in the world,'” Shaw explains. “I don’t make social commentary with my art, and I’m not trying to make the viewer figure out any obscure meaning. In the spirit of being inspired by the masters, both old and new, Shaw also experiments with collage, in which she takes watercolor paintings with which she is not 100 percent satisfied, cuts them into shapes, and “repurposes” them into a new art form. “I have taken inspiration for these from Henri Matisse and Eric Carle,” Shaw says, explaining that when 20th century French artist Matisse could no longer paint because of failing eyesight, he cut out shapes and had assistants paste them on large pieces of paper at his direction. One of Shaw’s early cut paper piece won third place in the Waterworks Art Center Show in Miles City, MT, for an exhibit with a paper theme. 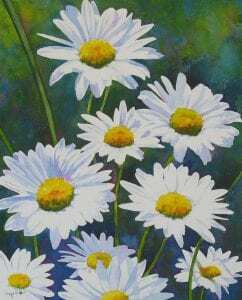 Over the last several years, Shaw has juried into major regional and national shows, and recently garnered First Place at the 311 Gallery Flowers and Garden Show in Raleigh, NC, where she won Honorable Mention last year. 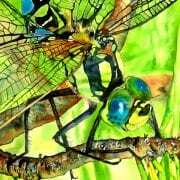 She has collected First, Second, and Third Place winnings at shows in Michigan, Colorado, Montana, and Washington, and has been the featured artist at the Crossroads Carnegie Art Center in Baker City, OR and the Cheryl Sallee Gallery in Auburn, WA. 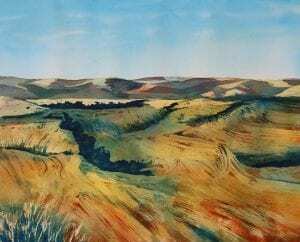 A member of CyberArt509, an artist’s cooperative encompassing artists in the 509 phone area code, and the Mid-Columbia Watercolor Society, Shaw shows her work throughout the Tri-Cities. 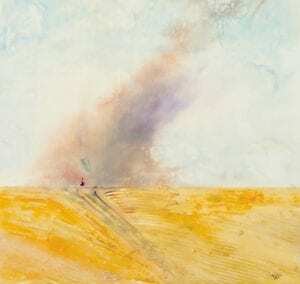 In addition to painting flowers, which she describes as being good subjects because they don’t move around, except in the wind, and are as close as her backyard, Shaw also creates landscapes in the same spontaneous, colorful style. “I strive to create recognizable images without being photographic,” Shaw says. 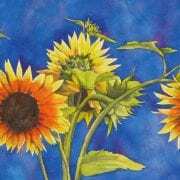 Maja Shaw is the featured Pacific Northwest artist at Wenaha Gallery from Monday, September 25 through Saturday, October 21, 2017. She will be at the gallery in person Saturday, October 7, from 11 a.m. to 4 p.m., during Wenaha Gallery’s Art Walk, part of the Dayton on Tour and Fall Festival Celebration. She will be joined by Dayton watercolor artist Jill Ingram; Walla Walla musician Roy Anderson; Winthrop basket weaver and singer Lauralee Northcott; and Walla Walla felt artist Linnea Keatts. Etiquette matters. And when you’re visiting a scrapyard, the rules of behavior are even stricter, because they have to be. 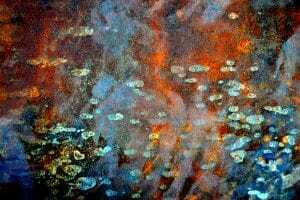 “Stay far away from the large pieces of heavy equipment being operated, employing big swinging arms with grasping tools or huge magnets that lift metal from place to place,” advises LuAnn Ostergaard, a fine art photographer who creates abstract art using digital images taken from . . . scrapyards. “The equipment may back over you, so watch their movements,” she adds. One must also be aware of protruding points; razor sharp edges; slippery, oily areas; and huge piles of metal that may cascade down on visitors at any time. 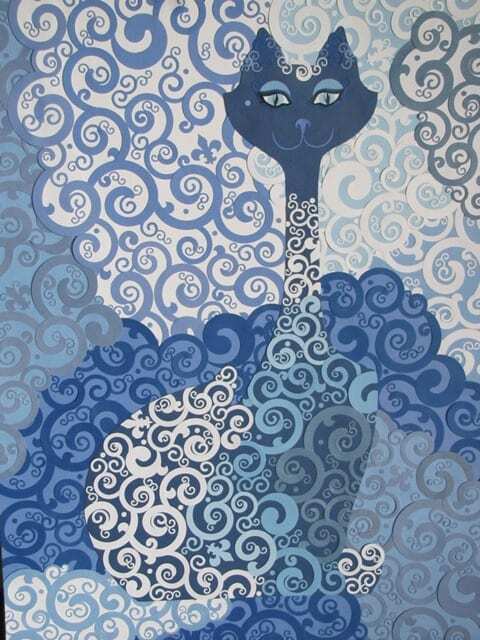 Ostergaard, who has identified herself as an artist since the first grade, comes from a long line of artists: her mother; her grandmother the singer and seamstress; her great-grandfather the concert pianist and sketcher. She married an artist, illustrator and animator Michael Rastovich, and with their son, Joseph, the three — dubbed the Talented Trio by friends — make their living creating in a home studio blurring any distinction between the two words. Upon first viewing Ostergaard’s art, many people regard her photographic images as paintings, and indeed, one of the most difficult aspects of her artwork is explaining what it actually is. They are photographs, with an attention to shape, texture, color and contrast, captured from the harsh places of the world and transformed into images enticing and enchanting. 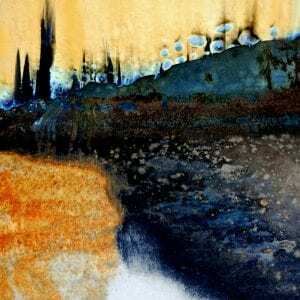 “On the computer, I bring up the saturation and contrast, and that usually reveals gorgeous color combinations and textures that I would never think of creating on my own,” Ostergaard says. Ostergaard sells her work to both private and corporate collectors, with pieces throughout the U.S. and in Sweden, Germany, UK, and Australia. One of her images is at 3 Lincoln Center, New York, NY, the building in which singer and actress Liza Minnelli lives. Others are at the Grand Hyatt Lodge, Denver, CO; Hilton Hotel, Charleston, SC; and Atlantis Hotel, Bahamas; and closer to home at the Trios Hospital in Kennewick. She sells her work at galleries, furniture stores, and jewelers throughout the Pacific Northwest. What she is looking for, Ostergaard says, is an essence of genuineness, revealing the most simple bit of beauty in something that, at first glance, may appear decrepit and ugly — junk, say, in a scrapyard. It is in these harsh and forgotten places that beauty resides, hidden within and around substances that are imperfect, impermanent, and incomplete, many in a state of deterioration or decomposition from entropy, the gradual decline into disorder that is a part of life on earth. Ostergaard describes this concept of entropy in conjunction with Wabi Sabi, the Japanese aesthetic philosophy that prizes the essential beauty of imperfect and impermanent things, and to which she ascribes inspiration. “This is represented in my art by rough textures as well as marks that time and use leave behind,” Ostergaard says. “Think of the story that can be told by the face of a very old person — the beauty of their perseverance and of the experiences they have gone through. It is what keeps her going back to the dusty, noisy, aromatic, dangerous world of the scrapyard, a place with a sweet, oily smell emanating from the mixture of every imaginable chemical thrown together, including, she suspects, possible radiation from the loads of materials received from the Hanford Nuclear Reservation for more than 70 years. It is a harsh, acrid, inhospitable, gritty, forgotten place, but it is Ostergaard’s wild, wonderful, wilderness world, one to which she invites the viewer. 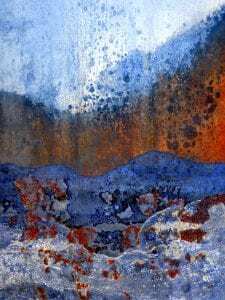 LuAnn Ostergaard is the Featured Pacific Northwest Artist at Wenaha Gallery from Monday, May 22 through Saturday, June 16, 2017. Ostergaard will be at the gallery Saturday, May 27 for a special two-person art show with Portland painter David Schatz, and both artists will be on hand to meet and greet visitors from 10:30 a.m. to 2 p.m. Free refreshments are provided. While Lauri Borer did not learn all she really needed to know in kindergarten, she did pick up a lot from the world of Walt Disney. The Walla Walla artist, before she moved to the Land of Many Waters in 2005, lived in Florida and worked with merchandising and human resources at the Walt Disney Company. “It’s worth remembering the characteristics that made me successful in my positions there,” the painter — who specializes in hot wax (encaustic) creation — describes how she applies past experiences to present endeavors. “Show up every day and do the work. Be flexible and open-minded. Don’t give up when something doesn’t work. 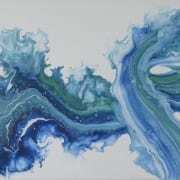 Borer, who has been creating art since she was 7 and holds a fine arts degree from the University of South Florida in Tampa, focuses on the landscapes of wherever she finds herself, capturing that world in both representational and abstract formats. Currently, that capture employs “the seductive mediums of encaustic painting and oil and cold wax,” Borer says, explaining encaustic as an ancient art form dating back to at least ancient Greece. Mixing molten beeswax with damar resin – a hardening agent which increases the melting point of the wax — Borer paints on wood substrates that do not flex and thereby cause the cooled wax of the finished work to crack. Her preferred surface shape is square, a non-traditional dimension that adds a sense of stability, solidity, and balance. “The versatility of the medium is unlimited,” Borer says. “Paintings can be finished to a smooth polished surface; transparent layers reveal colors and dimension as wax cures and hardens over time. Frequently, she finds a work takes on a life of its own, starting initially with her plan for its existence, but resulting in something pleasingly, uniquely different. 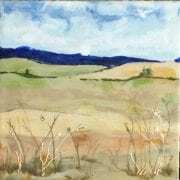 “One of the paintings that I had in the last show in Joseph (Wallowa Valley Valley Festival of Arts) began its life as a very realistic landscape — it looked exactly like the photo from which I drew my inspiration. “But the photo was perfect — it didn’t need to be copied. In addition to creating her artwork, Borer draws upon her organizational skills to showcase area and regional art, encouraged by the first person she met in Walla Walla, former area artist Bonnie Griffith, to volunteer at the Carnegie Art Center, then active as a community gallery. “I became part of the gallery committee responsible for hanging the shows each month, and became close friends with Bonnie and the other committee members, M’Lisse Moerk and Dianna Woolley. Later, Borer jumped into ArtSquared, Art Walla’s annual fundraiser benefiting arts education, becoming active on the committee from the event’s inception in 2013, and from there, joined a series of local artists producing a regular winter group show at CAVU Cellars. Presently showing at Wenaha Gallery, Borer is preparing for a summer exhibition at Initial Point Gallery in Meridian, Idaho. 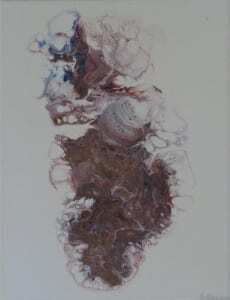 With artworks found in personal and corporate collections throughout the U.S., Borer has participated in juried shows in the Pacific Northwest; Santa Fe, NM; California, and Montana. 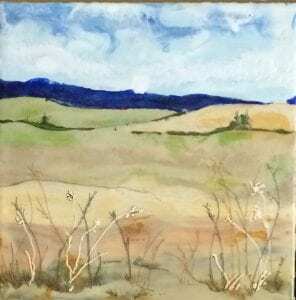 One of her pieces is in the permanent collection of the Encaustic Art Institute in Santa Fe. She’s busy, active, moving, creating, snapping reference photos with an enthusiasm and diligence that even has her husband alert to a potential painting. “He’s become an expert at quickly pulling over or spotting vistas he knows I’ll want to capture. In the spring, summer, and early fall the couple goes fly-fishing (with camera) on the Wallowa River. Summer finds them (with camera) on their small boat on the Snake River, fishing for bass and scavenging for flotsam for Borer’s art. All year round is studio time, and studio time is creation time. 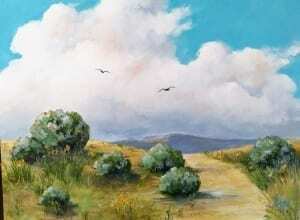 “I paint landscapes because I love nature,” Borer says. 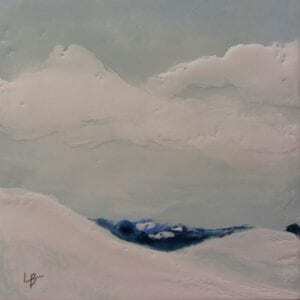 Lauri Borer is the featured Pacific Northwest Art Event artist from Monday, February 13, through Saturday, March 11. 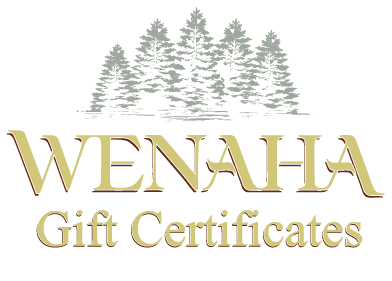 Wenaha Gallery is your destination location for Greenwich Workshop Fine Art Prints, professional customized framing, and original fine art paintings and sculpture by notable Pacific Northwest artists. Books, gifts, note cards, jigsaw puzzles, and more are also available. 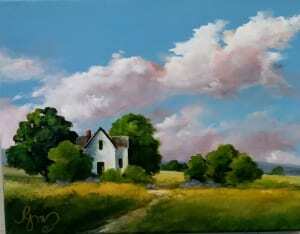 Visit the gallery today! 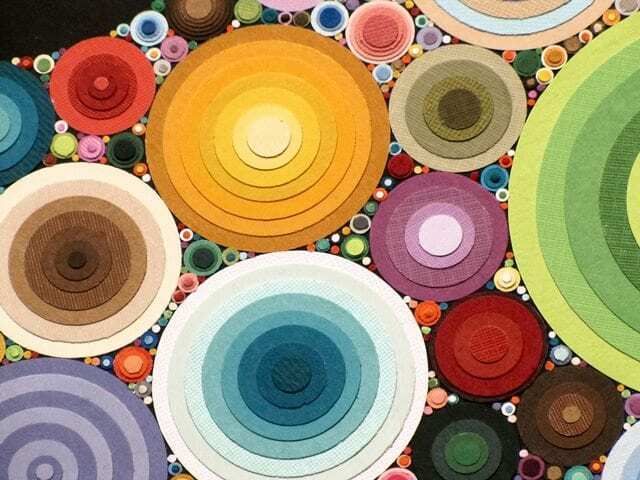 Most people, even if they flee at the mention of a fabric store, have met a quilter. Those unfamiliar with the craft marvel at the concept of taking yards of intact fabric, cutting it into smaller and disparate pieces, and reassembling those pieces into one planned, designed, and cohesive unit. But a quilt seems like a simple thing when placed side by side with the cut paper art of Cheri McGee, an Enterprise, OR, artist whose palette consists of thousands of snipped, scissored, and punched out pieces of paper — some of them smaller than a tick. Practiced throughout the world, paper art can be as basic as a silhouette, those portraits in profile that we associate with the Victorian era, or insanely complicated — as is the more intricate traditional work from China, Indonesia, Germany (Scherenschnitte), and the Philippines. McGee does a little of everything, embracing a style that ranges from a timelessly nostalgic folk art village scene to a sinuously flowing, almost curvaceous abstract mixed with realism. And then there are the mosaic works, consisting of itsy bitsy (think back to that tick, in company with sunflower seeds and some orange pips ) squares and circles and triangles and diamonds meticulously arranged to create a paper version of something you’d expect to find in a Turkish marketplace. 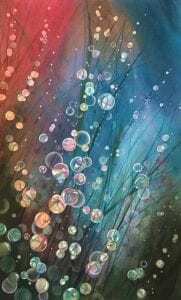 “Painting with oils may be easier,” the artist comments, explaining how, in the process of cutting and layering card stock into a cohesive image, weeks fly by. But it is this very detail and intricacy, in addition to the uniqueness of the medium itself, that is the attraction. “I have been working in paper for 30 years,” McGee says. “It began as both an experiment and a need for wall art when the phrase, ‘Necessity is the mother of invention’ kept echoing through my head.” Faced with a new home of blank, white walls, McGee’s eyes turned to her young daughter’s supply of construction paper, her hands picked up a pair of scissors, and a passion was born. 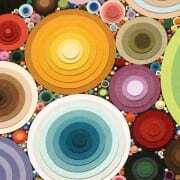 In short order, one pair of scissors grew into more than 25, and the cache of paper multiplied to, well, the equivalent of a quilter’s stash, as McGee kept an eye out, everywhere she traveled, for unique, unusual, textured, exotic, patterned, and colored stock. A spare room in her home functions as her studio, where creativity reigns and portable desk fans, even on hot days, do not. Every finished artwork is unique, and while McGee may work on multiple projects simultaneously, there are no (no pun intended) short cuts. While in the early days she pre-cut and stored in drawers images and shapes as a means of speeding up future artworks, McGee found that she never used them, preferring, instead, to custom cut exactly what was needed precisely when the moment called for it. It’s a build-as-you-go process, and the artwork itself makes its own demands. But when it comes to subject matter, anything goes, depending up McGee’s mood and inspiration, both of which are influenced by her interests, a childhood background in traveling as the daughter of a military family , and marriage to another artist, sculptor and flute carver Roger McGee. McGee’s works are in the homes of collectors from California to New York, as well as in Japan. 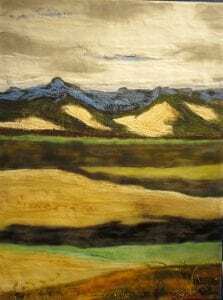 She has shown and sold her work at the Kalispell Art Show and Auction in Montana, Spokane’s MONAC Western Show and Auction, and the Western Art Association Show and Auction in Ellensburg. But the best place to find the artist herself is in that studio, scissors in one hand, paper in the other, as eyes, soul, and psyche focus on creating a work of art that has no twin of itself, anywhere, in the world. 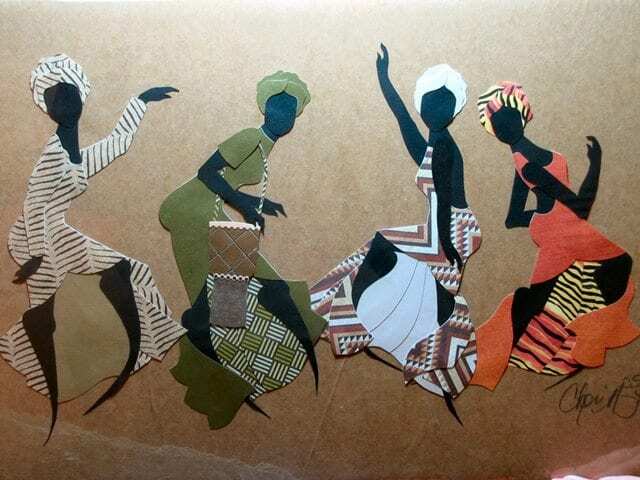 Cheri McGee’s cut paper art is on display at Wenaha Gallery through Saturday, June 27, 2015. Contact the gallery by phone at 800.755.2124 or e-mail art@wenaha.com. Gallery hours are 9 a.m. to 6 p.m. from Monday through Saturday, and by appointment. Visit the Wenaha Gallery website online at www.wenaha.com. 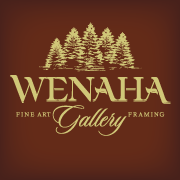 Wenaha Gallery is your destination location for Greenwich Workshop Fine Art Prints, professional customized framing, and original fine art paintings and sculpture by notable Pacific Northwest artists. Books, gifts, note cards, jigsaw puzzles, and more are also available. Visit at 219 East Main, Dayton, WA. This article was written by Carolyn Henderson. In the mid twentieth century, the term “square” was derogatively used to connote a boring traditionalist, one reluctant to take chances or break out of the box in his or her thinking. For 21st century artist Gordy Edberg, however, square is the new unusual, and the landscapes which he paints in this format are not constrained by what he calls the typical, conventional horizontal format that people have come to expect. “The square format, with its harmony of shape, is a useful and non-natural approach,” the Whidbey Island artist says. “By using the square structure, the landscape subject is contained more, and it removes the expected topographical connotations. With a principal focus upon the landscape, Edberg says that, although he does not purposely make political statements with his art, he is fascinated by the existing environment, and how it is changed by man’s impact upon it. There are buildings, roads, pathways, patterns, and how they integrate with their surroundings creates and shapes the finished piece. The very nature of lines themselves — an element strongly used in architectural drawing — invites the artist, and his viewers, to explore the realm of abstract within the world of reality. “I look for change occurring, things disappearing, other characteristics of the environment that suggest potential for abstraction expressions,” Edberg explains. And herein that square format intensifies the fluidity of form and shape, emphasizing the transcendental in the midst of physical reality, bringing out the best of each. “The goal is for the formal subject matter to be seen as a composition, an arrangement of shapes and colors and with aesthetic qualities while still suggesting place,” Edberg says. While Edberg has painted landscapes from throughout the Pacific Northwest and the west coast, as well as forays into Hawaii, Mexico, Ireland, England, France, Italy, and Greece, it is his Southeastern Washington landscapes that showcase, boldly, the integration of line and form, abstract and reality, outline and shape. Large, illusorily monochromatic fields and agricultural spreads are intersected by roads, power lines, waterways and the patterns of the fields themselves, a balance of both natural and man-made factors. Shots of unexpected color, calligraphy, textured paint, and marks and incisions upon the substrate surface enhance the mood and setting of the work, creating a place that is real and identifiable, yet not remotely as a camera would capture it. “Landscape images and also urbanscape and marinescape images painted in the studio are many times imagined in response to the mood and feel of actual places that I’ve sketched or painted en plein air,” Edberg says. 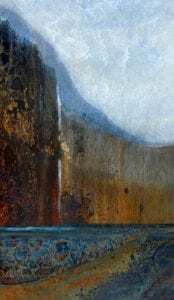 In the spirit of fluidity and freedom, he refers to plein air paintings or onsite sketches for his studio pieces, and does not rely upon the camera. The goal is to catch the mood, the place, the feeling, because within each landscape, Edberg feels, there is a story, and it is his pleasurable goal to tell that story. 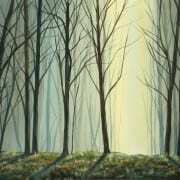 In addition to creating his oil-painted landscapes, Edberg also works in pastels, as well as designs and builds wood furniture. To do as much as he does requires space, and Edberg’s studio in the upper floor of his home is set up with four painting stations, including a wall easel which can accommodate up to six-foot sized paintings. The garage houses his woodworking equipment and tools, and, in addition to furniture making and packaging and shipping of paintings, another important activity takes place there: the cars can still be parked within. That’s the architect, sharing space creatively with the artist. 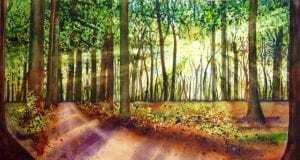 A signature member with the Northwest Pastel Society, Edberg has earned awards from both that organization and the Puget Sound Group of Northwest Artists, and he has received Best of Show at the Washington State Convention Center Art Exhibition. His work is housed in both private and corporate collections throughout the U.S., and he maintains paintings in galleries on both the East and West coasts. The architect may be retired, but the artist is very busy these days. Gordy Edberg is the featured artist at Wenaha Gallery’s Art Event from Monday, May 4 through Saturday, June 13, at Wenaha Gallery, 219 East Main Street, Dayton, WA. Dawn’s Jade Glow by Paul Henderson, guest artist at Wenaha Gallery. Very few of us, after watching a movie, embark upon a yearlong project of intense and highly disciplined creativity, but fine artist Paul Henderson of Yakima, WA, finds insight in uncommon places. Coffee is the medium of choice in Paul Henderson’s Coffee Capital, Seattle painting. Inspired by the film “Julie and Julia,” in which blogger Julie Powell challenges herself to cook, within one year, all 524 recipes in famed chef Julia Child’s first book, Henderson embarked upon his “Modern and Experimental Series,” with the intent of creating two paintings per week for 52 weeks. “I decided to not limit myself to detail but to do any style or subject from abstract to detail, to fantasy, to loose style, and to just experiment,” Henderson says. 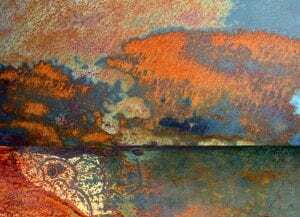 Color Storm by Paul Henderson, guest artist at Wenaha Gallery. Some of those methods involve fiberglass taping mesh, highly textured papers, netting, plastic, or styrofoam from packing boxes which Henderson attaches to the canvas, conveying a 3-D effect to a two-dimensional substrate. Another innovation revolves around something most of us have in our kitchen cupboards — coffee — to give new perspective upon the medium of watercolor. Planetory by Paul Henderson, guest artist at Wenaha Gallery. Henderson’s coffee paintings — which use both regular and decaf, and whatever brand of coffee he happens to be drinking at that time — remain consistently popular, capturing Americana themes including both wildlife and western. He has shown at grand openings of many Nordstrom coffee bars as well as at Starbucks, and he offers both originals and prints through his studio and at local coffee bars. With a skill repertoire that ranges from highly detailed, almost photo-representational wildlife to dreamily hued abstract, Henderson is not circumscribed by any subject matter, and not only does he create Native American art as well as planetary fantasy, he also incorporates the two. In the same manner, his floral and landscape representational works dance in a background of abstract. It is all part of the spirit of exploration and adventure, an insistence upon not being boxed in, nor expecting his viewer to be so. Forest Glow by Paul Henderson, Wenaha Gallery guest artist. Henderson has exhibited in shows and galleries throughout the west, including Reno, Nevada, Hawaii, and California, and at one point was contacted by a gallery in Hawaii asking if he would paint a falcon to be presented at a private showing for the king of Saudi Arabia. 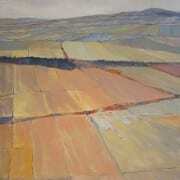 Autumn Glow by Paul Henderson, Wenaha Gallery guest artist. He has studied under Don Crook, affectionately known as the “Rockwell of Western Art,” and attended workshops by pastel and portraiture artist Daniel Green. His learning, his creating, his innovation and research — including classes on animal anatomy and taxidermy to give him a better understanding of his subject matter — have revolved around a schedule that involves full-time employment in a different arena than art. After hours, it’s time to create. There is a reason that the movie, “Julie and Julia,” resonated so much with Henderson — he really does approach life with an international flair. 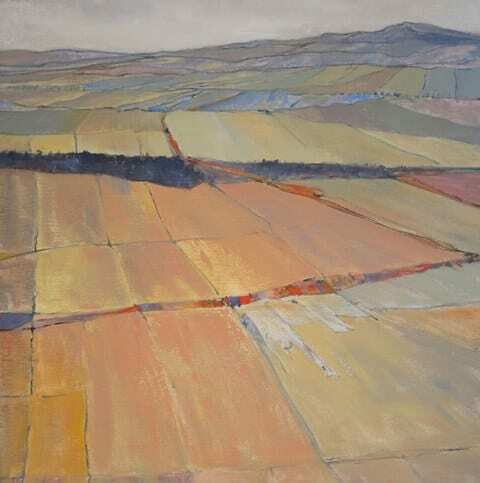 Paul Henderson is the featured artist at Wenaha Gallery’s Art Event from Saturday, April 4 through Saturday May 2, at Wenaha Gallery, 219 East Main Street, Dayton, WA. There is an artist’s reception April 4, from 1-4 p.m. Free refreshments will be served, and Paul plans to create one of his coffee paintings during the reception.